Make him a treat with designer cufflinks engraved with photos, text or initials. Your personalised cufflinks need not be identical. Have twins? Have one on each. Like letters? Add two different words and come up with a great personalised design. These smart and sophisticated pair of personalised cufflinks are a gorgeous gift for the men in your life. It might be as simple as a father's day gift for him with adding the photos of the kids to these unique and original personalised accessory for him. Select your ideal photos and print them on the 15 or 18mm round or square cufflinks with surprise photo clarity. They will stay firm on the shirt, and firmly in mind when he gets personalised picture cufflinks out of the box. Create your own pair in our design system and see your design come to life. Love that you can add your own personal touch to the cufflinks! They were easy to make and they arrived from London to Australia in only a week! Great! I was worried that the photo cufflinks would not have a great quality picture, but I was worried for nothing! The photo cufflinks that I ordered for my Fiancee were better than I ever expected. The quality of the cufflinks are amazing and I couldn't have asked for anything more! The shipping time was super fast. When you need to look your best, it’s the little finishing touches that give you the edge. When buttons are for the masses, make sure you stand out with a customised accessory bearing your name, favourite sports team or a photo of your Bride-to-Be. Our high-quality bespoke cuff links add a touch of class and sophistication that others cannot. Tailored to you or your occasion, a custom pair will show others you’ve thought ahead, and have everything covered! Order a pair for a special event, wedding or company interview using our photo engraved cufflink creator. 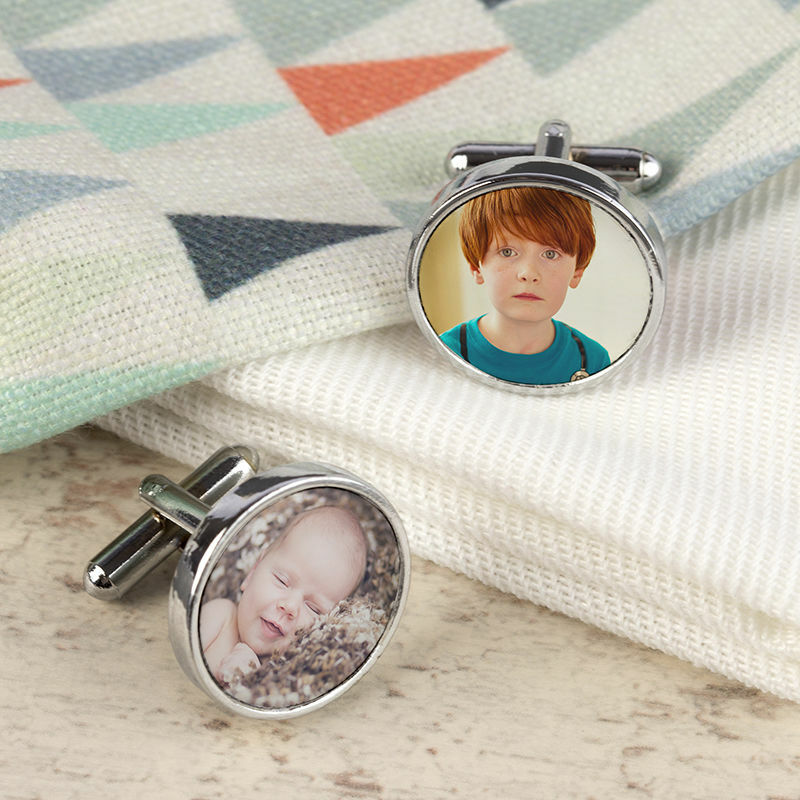 We print your photos onto a glossy surface within the round or square cufflinks set. Your designs won't fade over time or scratch off, as we use a specialist technique that creates a permanent, long lasting print. They're hand finished to an exquisite quality, ensuring your recipient will fall straight in love with their new stylish accessory. Part of the joy of planning a wedding is focusing on the details, and getting everything ready in advance with perfect preparation. Here at Bags of Love, we help by giving you all the tools you need, like our custom creator. Design your Groom or Best Man cuff links on-line in our interface and view high-quality previews before you buy. Need them in a hurry? We print and send same day, with impressively fast delivery. Please note: Your pair of personalised cufflinks are made from metal, which has a slightly worn finish. This gives the cufflinks a charming rustic, almost antique quality, which adds to their individuality. As each item is bespoke and handmade to order, the post and toggle clasp may vary slightly in shape and size, this will not impact the overall look of your cufflinks, or affect their usage. If you have any queries, please get in touch with us via the chat button.